BigTimeBats has a VERY LIMITED supply of autographed baseballs, bats and other Rangers memorabilia now available. 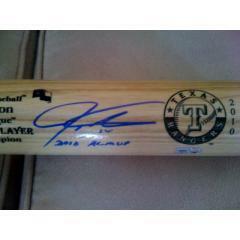 These items are signed by players from the 2011 World Series Texas Rangers. Due to very high demand for authenticated autographed memorabilia, BigTimeBats has initiated a new ordering process for limited inventory collectibles. To enhance your collecting experience we ask that you provide us with the requested information using the Contact Form shown below, and a member of the BigTimeBats Customer Service Team will be in touch to assist you. We will respond to your inquiry promptly in an effort to help you obtain the autographed collectible of your choice.